The second edition of Mildred Blaxter's successful and highly respected book offers a comprehensive and engaging introduction to the key debates surrounding the concept of health today. It discusses how health is defined, constructed, experienced and acted out in contemporary developed societies, drawing on a range of empirical data from the USA, Britain, France, and many other countries. The new edition has been thoroughly revised and updated, with new material added on health and identity, the "new genetics", the sociology of the body, and the formation of health capital throughout the life course. The topic is the concept of health, rather than the more usual emphasis on illness and health-care systems. Special emphasis is given to the lay perspective to show how people themselves think about and experience health. Blaxter guides students through all the relevant conceptual models of the relationship of health to the structure of society, from inequality in health to the ideas of the risk society, the 'socio-biological translation' and the contribution of health to social capital. The book concludes with a comprehensively revised and thought-provoking discussion of the impact of new technology, the boundaries between life and death, modern commodification of health, technological transformations of the body and theories of evolutionary biology. Health is an invaluable textbook for students of medicine and other health professions as well as those studying sociology, health sciences and health promotion. 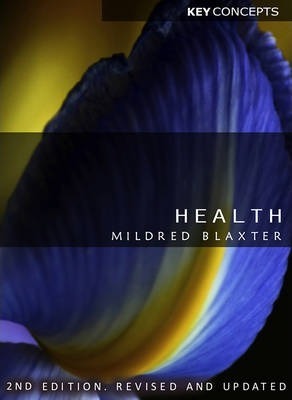 The second edition of Mildred Blaxter's successful and highly respected book offers a comprehensive and engaging introduction to the key debates surrounding the concept of health today. It discusses how health is defined, constructed, experienced and acted out in contemporary developed societies, drawing on a range of empirical data from the USA, Britain, France, and many other countries. The new edition has been thoroughly revised and updated, with new material added on health and identity, the "new genetics," the sociology of the body, and the formation of health capital throughout the life course. The topic is the concept of health, rather than the more usual emphasis on illness and health-care systems. Special emphasis is given to the lay perspective to show how people themselves think about and experience health. Blaxter guides students through all the relevant conceptual models of the relationship of health to the structure of society, from inequality in health to the ideas of the risk society, the 'socio-biological translation' and the contribution of health to social capital. The book concludes with a comprehensively revised and thought-provoking discussion of the impact of new technology, the boundaries between life and death, modern commodification of health, technological transformations of the body and theories of evolutionary biology. Health is an invaluable textbook for students of medicine and other health professions as well as those studying sociology, health sciences and health promotion. Introduction. 1. How is health defined? Health as the absence of illness. Disease as deviance. Health as balance or homeostasis. Health as function. Health as state or status. The biomedical model. Contemporary biomedicine. The social model. Health, disease, illness and sickness. How is health measured? Health capital. 2. How is health constructed? Health as social construction. Constructions of history. Constructions of culture. Constructivism and feminism. Illness, labelling and stigma. Constructions of mental illness. Constructions of disability. The critique of relativism. Medicalisation and the constructions of medical practice. 3. How is health embodied and experienced? Embodiment. Lay definitions of health. Social representations of health. Self-rated health. Concepts of the causes of health and illness. Health histories and subjective health capital. Illness narratives. Limitations of narrative. The search for meaning. Health as moral discourse and metaphor. Responsibility for health. 4. How is health enacted? The rise and fall of 'illness behaviour'. Person to patient: help-seeking behaviour. The patient role. Control and concordance. Enacted behaviour. Behaving 'healthily'. Structure/agency: health as cultural consumption. Structure/agency: health as self-governance. 5. How is health related to social systems? A functional relationship. Responses to functionalism. Medicine and society. Health, economic development and social organization. The downside of economic development. The concept of inequality in health. The nature and extent of inequalities. The causes of inequality. The socio-biologic translation. Neo-materialistic explanations. Social capital. 6. Contemporary change in the meaning of health. Technology and postmodernity. Changing boundaries between ill and not-ill. Changing boundaries of life and death. Changing boundaries between self and not-self. Changing boundaries between therapy and enhancement. Information technologies and medical practice. Changing attitudes to health and medicine. New technologies and the risk society. Evolutionary medicine. Conclusion. References. Index. Mildred Blaxter is Hon. Professor of Medical Sociology at the Department of Social Medicine, University of Bristol.